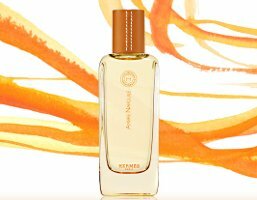 Like the others in the Hermessence line of fragrances (see Rose Ikebana and Poivre Samarcande), Ambre Narguile was created by Hermès house nose Jean-Claude Ellena and released in 2004. Ambre Narguile is meant to evoke cashmere, and features notes of benzoin, labdanum, musk, vanilla, caramel, honey, sugared tonka bean, grilled sesame seeds, cinnamon, rum, coumarine and white orchids. All of the Hermessence perfumes are foody to one degree or another; Ambre Narguile is the dessert course of the quartet. It starts out as a thin but sharp mixture of resins and sweet, vanillic notes. It stays far too sweet for my taste for the first 30 minutes, but it deepens over a period of some hours to a rich, warm amber with smoky and spicy undertones. There is a nice dusting of cinnamon, and a dash of honey and caramel. I don't catch the rum or anything floral. I have seen it compared to everything from flan to apple strudel to cinnamon buns, but the dry down is not as sweet as those references might imply, and it is considerably more sophisticated and interesting than your average foody-comfort fragrance. The lasting power is excellent, and it continues to improve over a period of some hours. It is beautifully done, but amber is not among my favorite fragrance notes. It is therefore no surprise that this was not a purchase for me, but if I had to guess, I would say that this is probably the top selling perfume in the Hermessence collection. It is also the only Hermessence that really seems to fit with its fabric (cashmere). As that suggests, it is probably better suited to fall/winter, although on a cool summer day like we are having here, it is not at all overwhelming. Kudos, by the way, to Hermès for the lovely and very generous (they look like they hold at least 4 ml) sample vials. On my last visit to the New York boutique, they were handing out two per customer on request. For buying information, see the listing for Hermès under Perfume Houses. Another very interesting post, NST. I'm not a fan of this particular scent, but I loved reading about it! Terrific review, Robin! I can smell the fragrance as I read. To me it smells of Indian sesame and raisin confections, which I love. I found Ambre Narguile to be very rich, not as sweet as one might think, but certainly heavy on amber. I liked it, since I like amber, but it is not the fragrance I even think about this the summer. It can be overwhelming. GG, I am still assuming that one day I will fall in love with amber & patchouli. Weirder things have happened. BTW, is green soon to be replaced with another color? Just curious. V, funny, I smell some fruitiness in the top notes that could be raisinish, but I don't smell any sesame seeds. I should go toast some sesame seeds and see what they smell like. Oh, the fragrance does evoke a luxe cashmere camel-colored turteneck. In the winter months, I just want to snuggle deep within the neck of it and breath in its resinous, dusky sweetness. The lasting power of Ambre Narguile is outstanding! One nice spritz after a bath in the morning, right on the heart center, last all day. And, as you mentioned in your review, the fragrance becomes deeper and more interesting as the hours pass. Great review, divine Miss R! Bravo! It is actually amazing that it is an Eau de Toilette. An EdP would presumably last for days. It is a darn shame I don't like amber. This is supposed to be an amber for amber haters. Well, it was too rich and foody and ambery for me. The only time I could see myself wearing this scent is Christmas time because of the cinnamon and sweet spices. For my winter comfort, snuggling scent I will stick with Montale Sweet Oriental Dream (thanks to you for the sample!). That's right, it is an EDT, one of the very few that feels like an EDP. I like amber in the base, but I must say that a fragrance built around an amber note, like L'Artisan's, would not appeal to me. This is one of those fragrances I was certain I would love. I like amber when it's not super strong like SL Ambre Sultan. I LOVE caramel, and all the desserts which were mentioned in the reviews for this fragrance. But…I didn't love this. The drydown 12 hours after applying is a wonderful soft and lovely amber, but I just feel “meh” about everything that happens beforehand. I'm a bit perplexed. I still haven't swapped away my sample, and I retry this every so often, thinking that I will finally fall in love with it. Hasn't happened yet. Yes, there is such a thing as too much staying power, LOL! And it is inevitably associated with a fragrance I can't stand. F, I tried to think of cheeky response to your cheeky comment, but failed miserably. Hiris smells *nothing* like Vetiver Tonka to me. Actually I am curious: does Hiris smell like vetiver to you, or is it that VT smells like iris? Or something else? LOL — I think I speak for amber fans worldwide when I say that we don't want an amber for amber haters. We have plenty of other fish to fry. But I do see the point, sort of, of the designation. This isn't as sticky-heavy-sour as some ambers are on me. I honestly think that part of the reason (silly though it may be) that I didn't swap away my sample is just the pretty sample vial. I can be patient through unpleasant top notes, but 12 hours is too long to wait for anything. Ambre Narguile is my favorite Hermessence…though it's far sweeter than my tastes usually run. I've always thought I detected cedar in this. The “cedar” cutting through the sweetness of the honey (which I normally can't abide) is what makes this wearable for me. However, cedar is not listed as a note, and I'm wondering if the “cedar” I'm smelling is actually labadnum (which is also a note in another of my so-called “cedar” favorites, CdG Ouarzazate). I have a sadly uneducated nose…but maybe there is hope for me if I keep reading your blog. Thanks for the fun Hermessence series reviews! In all fairness – I am going to go try both now. One on each wrist and get back to you!!! As always – you never know what my flaky chemistry will do to a wonderful fragrance. Will be back soon! If you have skin that can make the reasonably priced Hiris smell like the wildly expensive VT, you are a lucky woman indeed! Well, I'd be surprised if there isn't wood in there somewhere. Maybe your nose is far better than mine! Yes, blue. In 8 days. Agree with you completely! Pure amber, and I smell my grandmother's cupboard–a great smell, but not something I want to smell like. But amber built into the base adds a great support to the composition and pleasant warmth. I need to re-test these all over again. I wasn't that impressed with them but I feel that I didn't give them enough of a chance. AN is one of my favorite scents. I just feel so sophisticated when I wear it. I reserve it for cooler weather. I haven't sniffed the other Hermessences, but will when I get the chance. Hi K! Interesting that you are the second person to mention cooler weather. I would have thought it was more of a summery thing. Will have to try it again in the fall. I really liked this one at first, but as I wore it, my skin brought out something ever-so-slightly unpleasant, and ultimately, I decided it wasn't for me. Probably a good thing! I have read a bunch of posts/blogs on the Hermessence collection and was so curious that I bought the Hermessence 'sample' collection from the Madison Avenue boutique. The collection came with Ambre Narguile, Rose Ikebana, Vetiver Tonka and Poivre Samarcande. I also received tiny samples of Osmanthe Yunnan and Paprika Brasil. I have to say that the Ambre Narguile is my favorite of the 6, with Vetiver Tonka right behind. I have never tried an “amber” scent, perhaps that's why I am loving it right now. I don't know much about perfumes (sorry! ), but I love and wear all Hermes scents (with the exception of Hiris and Rouge which are WAY too strong for me). My question is that alot of people are commenting on how “strong” some of the Hermessence scents are and on my skin they seem “light.” But they do last… Perhaps I am just not smelling how “stinky” I am right now?!?! If anyone could shed some light, I'd appreciate it! Hmmm. I find Vetiver Tonka & Ambre Narguile to be about “medium”, I guess, in terms of strength. All of the rest of them are fairly sheer. It would be hard to wear too much Osmanthe Yunnan, I should think, but I can see possibly overdoing the Ambre. It is always hard to tell if you're wearing too much without asking someone else! Hi there! Thanks for the help. I am new to the site, and have been enjoying it! Also, kudos for making the blog listsing in the lastest issue of Lucky Magazine! I agree about the Osmanthe Yunnan…it's stronger. But I think 'sweeter.' It very much reminds me of Givenchy's L'Interdit (2nd release, not the original), which is said to have been Audrey Hepburn's scent. It's a favorite of mine for the summer. I need to re-try L'Interdit one of these days — honestly can't even remember what it smells like! I was in Monte Carlo recently and went to work out at a gym near the Beach Club. Monte Carlo is probably NOT the best place for fitness fans and sweating you know. Too many cameras, too many security guards observing you, too many beautiful people all made up and decked-out in Jewelry and Hermes. But what struck me was the sweet lingering scent of Ambre Narguile on people sweatin' it out at that gym! It was mostly on women but some men too. It became really cloying and I started wondering if I caused the same problem to others when I wore it on warm days. Truly a nice scent enjoyed on a cold dry day and wearing cashmere and wool not on warm days or while working out in sweat drenched jerseys! Agree it is best for a cold dry day. Even then, I'd prefer Vetiver Tonka, but that is just my personal taste. I come with bad news, but bad news will wait in line. I went down to Hermes and got samples of the other three Hermessences (AN, PS, and BdR), just to make sure I was on base with my favorites; it's still Paprika Brasil in the top. Amber Narguile was nice on the card the first time I went in, but the apple was very prominent and worried me. I like it a lot now that it's on my skin, but it's so not me. I've never really seen myself as a sweets-perfume kind of guy. I have to say, it smells like baked apples rather than any of the other desserts mentioned, but very luxurious. I'm still getting apple, hours later, but it's still very sweet. I'll revisit in the winter; even though I do typically like to wear heavy scents in the summer and cold scents in the winter. Even if it isn't my kind of scent, my admiration for JCE grows exponentially with each scent I sniff. Now for the bad news: the Discovery set. The sampler one is only one of each of the original four; as far as I know, they don't even make 15ml bottles for the rest of the series. As you reported, they also make a set of four of the same scent. I didn't ask if they did that for all the scents (I was too discouraged for rational thought), so there may be hope. Another con: the bottles aren't nearly as pretty as the 100ml. So, the way I see it, I'm getting a full-size of Paprika Brasil and more samples of the ones I like as long as I can get away with it. xD Which, I mean, proportionally, makes sense. I've used 2/3 of my PB sample and only 1/5 of the next current favorite as of the first round of samples, Vetiver Tonka. I hope that cleared things up a little. Oh, but I think my little bottles are adorable! Still, very sad to hear they haven't done the newer scents. I'd like a little Brin de Reglisse some day, and would never buy the bigger bottle. Thanks for the update! Why can’t you test it? I wont be going to an Hermes boutique anytime soon. I guess the Flowerbomb is at least cheaper. I’m thinking about winter frags, which is how I came upon your post, and I will definitely try this – I think there’s an Hermes boutique here in Hamburg. It sounds right for me, but I have to be sure it isn’t too sweet, even for me. Yes, they have lovely sample vials, I got two on my visit to the boutique in Boston (Osmanthe Yunnan and Rose Ikebana, both rather too light in my opinion). It’s definitely heavier than those two, but it’s pretty darned sweet. Good luck!